It’s the festive season and the turn of the year, and time for the Mari Lwyd to be calling at houses and pubs and wishing them good luck. The Mari Lwyd – a horse’s skull carried by one of the party, disguised by a white sheet – used to be a purely a local custom, bounded by the old counties of Glamorgan and Gwent; however, the tradition has boomed in recent years, and Maris can go out all over Wales, from Holywell in Flintshire to Pembrokeshire. The name is obscure; it could mean The Grey Mare, or The Grey Mary. ‘Mari’ is a feminine noun, which always takes a mutation; so, ‘Mari Lwyd’ is quite correct. Caseg Cwmtawe: The Swansea Valley Mari Lwyd is visiting pubs and care homes in Cwmllynfell, Ynysmeudwy, Ystalyfera and Upper Cwmtwrch. The Mari Lwyd (in Welsh, Y Fari Lwyd) is one of the strangest and most ancient of a number of customs with which people in Glamorgan and Gwent used to mark the passing of the darkest days of midwinter. It’s no accident that Christmas, with its emphasis on fire, lights and decorations, is celebrated at this time of year. Before the arrival of Christianity, the Romans used to hold similar festivities at the same time. And before the Romans, these long, cold nights were the time of fire festivals in Wales and across the Celtic World. The tradition of Y Fari Lwyd has certain pre-Christian origins. In Celtic Britain, the horse was seen as a symbol of power and fertility and prowess on the battlefield. In Celtic mythology, animals who had the ability to cross between this world and the underworld (the Celtic Annwn) are traditionally white or grey coloured. Arawn, the King of Annwn’s dogs, is white with red ears and he rides on a large grey horse. From this time on, the days get longer as spring approaches. All these festivals and customs reflect man’s awe at nature’s annual miracle of death and rebirth. That’s why evergreens like the holly and the ivy are such a feature of the season… and why a dead horse mysteriously comes back to life. Customs involving animal skulls are widely known across the world. The Native Americans of Alaska use them, as do the Indonesian people of Java – and variations crop up at most points of the globe in between. Traditionally a New Year’s Eve celebration, there has been a growing interest in Y Fari Lwyd in recent years which has seen a resurgence in groups performing this tradition across Wales. Y Fari Lwyd and her group go from house to house and pub to pub and try to gain access by performing a series of verses, or ‘pwnco’. The inhabitants would reply with their own verses in a battle to outwit Mari and her gang and prevent her from entering. Eventually she will be let in, as this confers luck on the household for the coming year and scares out anything unwanted from the previous year. Once inside, more songs are sung and the group is given drinks and food. Mari often becomes quite mischievous and takes particular fancy to any young women there, chasing them and generally causing trouble. The Mari party consists of commedia del’arte characters. The Merryman plays the fiddle; The Leader, plus top hat, holds the Mari’s reins; The Sergeant keeps the peace. Pwnsh a Siwan (Punch and Judy) are played by two male characters. The practice of disguising the characters was to preserve anonymity and to distance them from everyday life. This tradition of blackening or colouring the face to take on another ‘character’ can be found in most indigenous cultures and in Britain in the older Morris sides. What makes the Mari Lwyd unique is the pwnco tradition, the Welsh-language questioning and answer process in rhyming verse. 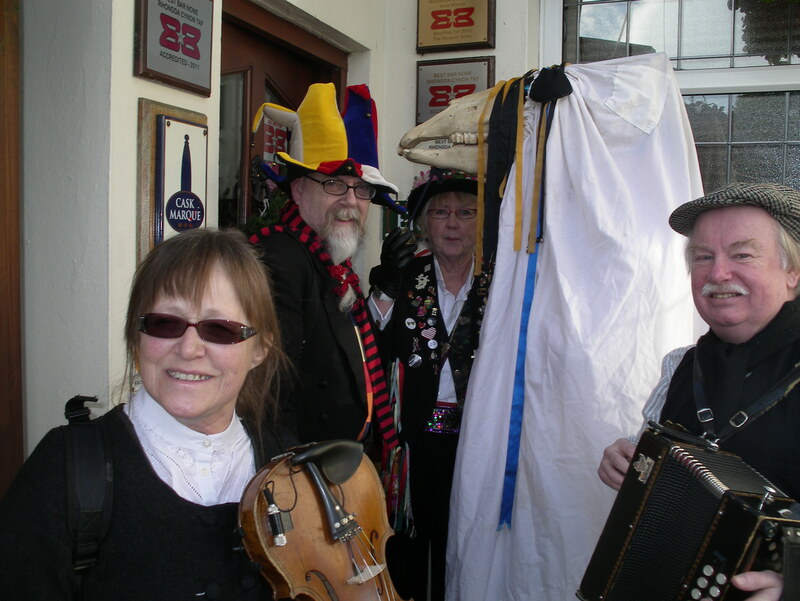 The Mari Lwyd and her party arrive at the door of the house or pub, where they sing several introductory verses. Then comes a battle of wits (pwnco) in which the people inside the door and the Mari party outside exchange challenges and insults in rhyme. At the end of the battle, which can be as long as the creativity of the two parties holds out, the Mari party enters with another song. In the Llynfi Valley village of Llangynwyd, the Mari Lwyd would call in at The Old House, reputed to be the oldest pub in Wales, Cynwyd Evans leading her. But over the years, the Mari Lwyd party died out and the custom ceased. However, Welsh speakers in Cwmni Caerdydd, the Cardiff dance company, revived it, and the Llangynwyd Mari Lwyd still calls at The Old House on New Year’s Day. A memorable moment was when the elderly Cynwyd stood up and sang enough verses to keep Y Fari Lwyd waiting at the door! Eventually Cynwyd died, and The Old House honoured him by putting up a new signboard, with the Mari Lwyd and Cynwyd’s top-hatted image. It had the opposite effect. From his grave, Nefydd must be regretting the folly of the 20 verses, published for all to see. The Welsh population hungrily seized on the fragments of the Mari’s tradition, and – thanks to Nefydd – we can now study the Mari verses in all their true splendour. In some places, like Llantrisant, the pwnco disappeared and the Mari party sang only their arrival verses, adding Christmas carols to the repertoire. 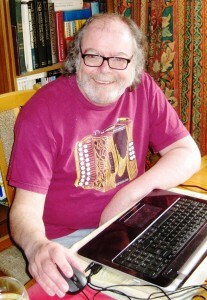 In other areas, such as Llanharry, Cowbridge and the Vale of Glamorgan, the parties interspersed English-language verses with Welsh-language rhymes. The Mari could still be seen in many villages in the 1920s and 1930s. 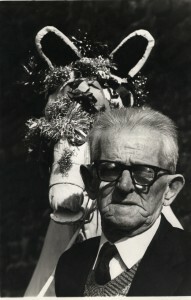 By the 1960s, only a few survived in places like Pentyrch and Pencoed – but Llantrisant’s Mari Lwyd custom was revived nearly 34 years ago by members of Llantrisant Folk Club, very much in the style in which it was being performed when it originally died out, probably at the start of the Second World War. Mr Vernon Rees, a freeman of Llantrisant, remembered that his father, Tom John Rees, was in charge of the Llantrisant Mari. The Llantrisant head was not a real skull but was made of wood, bandaged right down to the snout to make it look like a genuine horse’s head. Mr Rees remembered the Mari being kept in the cupboard under the stairs and knows it was still around in 1937, when the family moved house. Tom John Rees was a miner at Ynysmaerdy Colliery, just north of Llantrisant, and died of pneumoconiosis in 1945, when he was only 45 years old. 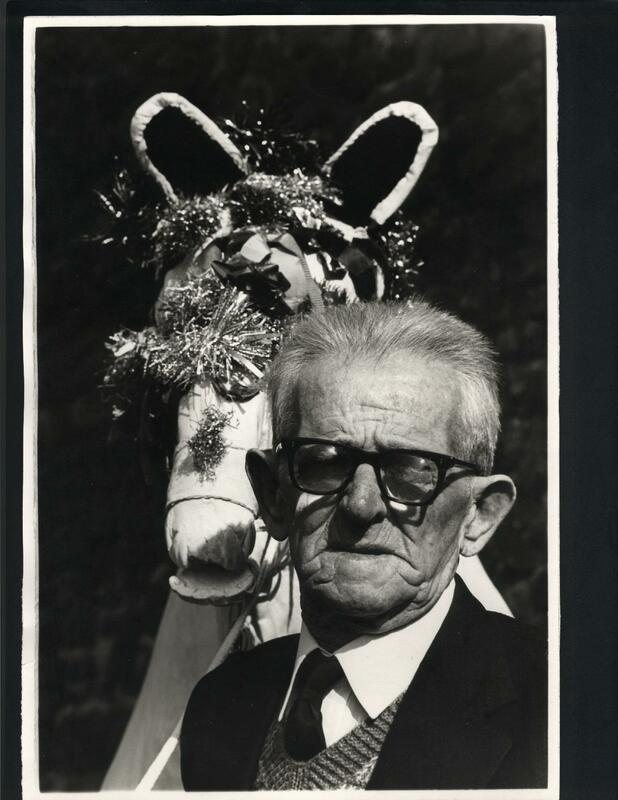 Mr Rees did not know whether his mother gave the Mari Lwyd away or what became of it. In fact, four Mari Lwyds called at the pubs and houses in the Llantrisant area until recently – Tom John Rees’s Mari; the Pontyclun Mari (which Cyril Harvey, the father of Mrs Pat Smith, used to be a regular attender. 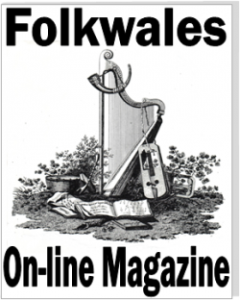 Pat is the current keeper of the Llantrisant Folk Club Mari); the Castellau Mari Lwyd, which Castellau chapelgoers sang the traditional Can Y Fari and Y Washael songs; and the Llantrisant Folk Club Mari Lwyd. The “new” Mari is a genuine skull, which was prepared and mounted in the traditional fashion by Ian Jones of Pencoed, the last thatcher working in South Wales. He found a young horse’s skull on a Glamorgan coast beach, cleaned it up and donated it to Llantrisant Folk Club, who have carried on the Mari Lwyd tradition for 33 years. Today, she is a regular and much-loved feature of Llantrisant and Pontyclun’s Christmas and New Year festivities. In English-speaking Gower, Horses’ Heads were a strong tradition which has died out now. The Mumbles Horse’s Head was started more than 140 years ago; the horse was named Sharper, who used to pull a vegetable cart, and his skull was dug up from a quarry. Village tradition has it that the vicar, who came from Derby, wrote the song ‘Poor Old Horse’ – but different versions existed all over Gower. The Mumbles schoolboys were not allowed to go with the horse – so they obtained a ram’s head from the butcher, boiled it, and carried the head in the wake of the horse, singing a local version of ‘The Derby Ram’. For an encore, the Horse party would sing ‘The Mistletoe Bough’, a “true” story which Mumbles villagers believed happened at Oystermouth Castle. For the weather is cold and we must have more. 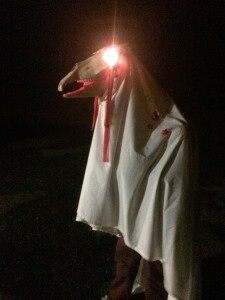 The Gower Horses’ Heads are past and gone, but a Welsh-speaking Mari Lwyd has taken their place – this time in the village of Pennard, where she is leading the lantern procession. And the Caseg Cwmtawe, the Swansea Valley Mari Lwyd, is out and about this December, calling in on pubs in Cwmllynfell, Ynysmeudwy, Ystalyfera and Upper Cwmtwrch. 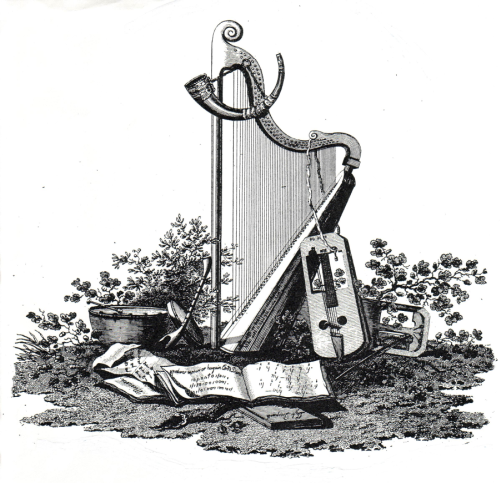 The strength of the Mari tradition can be measured at the National Eisteddfod, which takes place in August. At one Eisteddfod, 30 Maris turned up. A genuine horse’s skull is gold dust these days – but the Wales folk development organisation trac has published details on making an ingenious ‘flat-pac’ cardboard Mari, which looks like the real thing and encourages would-be Mari parties to celebrate the South Wales tradition once again.